Since herbicidal chemicals are often toxic to plant tissue, it is inadvisable to use the application equipment for other purpose. Enough of the herbicide may remain in the equipment to damage crop plants in other spray application. Preemergence herbicides are often applied as a spray. This destroys the earliest weeds and gives the crop an advantage throughout the entire season. Sprayers. Power or hand-operated sprayers are most commonly used to apply herbicides as liquid formulations (wettable powders in water or water dispersible granules in water) either directly on the weeds or onto the soil. 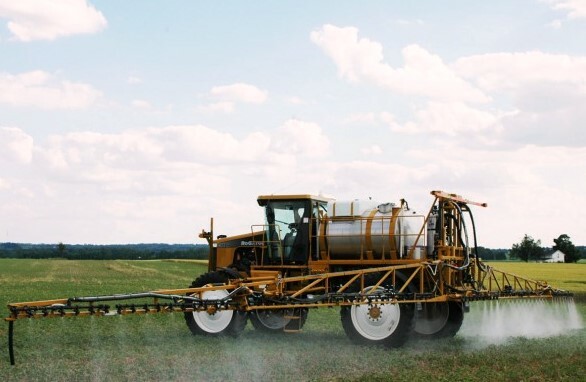 The sprayer is either low volume, applying a concentrated form of the herbicide in small amount per unit area, or high volume, applying less concentrated solutions but in larger amounts per unit area. Most herbicides are applied wit sprayers. The amount of the herbicide applied is generally calculated in kilograms per hectare (pounds per acre) of a given concentration as directed on the label. Granular application. Equipment is available to apply granular forms of herbicides as a preemergence application to the soil over the crop rows when the seeds are being drilled into the soil. At high application rates, the granules of the herbicide itself are applied; at lower rates, the granules are first mixed with a carrier such as sand or vermiculite to increase the bulk, thus permitting better distribution of the active herbicide particles,. Granular application eliminates the need for hauling quantities of water, and the application equipment is much simpler and less expensive than spray machinery. Granular application, however, is not as uniform as water sprays. Winds can blow the granules and carrier from where it should be applied; in addition, heavy rains or irrigation can wash the granules away. Granular forms of herbicides are generally more costly than other types because of higher shipping costs. Mixing with soil. Preemergence herbicides, applied either as a spray or granules, are worked by disking into the upper few inches of the soil to bring them into contract with weed seeds. This application method is effective only if the seed bed is well prepared, lacks large soil clods, and has the proper soil moisture neither dry nor excessively wet. Aircraft application. Applications of herbicides by airplane or helicopter are particularly useful for large areas or in situations where ground equipment can not be readily used. Large areas of grain or forage crops are covered economically in this manner, such as flooded rice fields that can’t be easily treated with herbicides in any other manner. However, air application of herbicides is not used in populated areas owing to hazards. Water application. Herbicides are applied in sprinkler or furrow irrigation water. This method can be very effective on some crops when water placement is accurately and uniformly controlled. 0 Response to "Herbicide Application Equipment"